I hate it when companies try to install sneak software on my computer. Particularly is this true when the software they are unethically trying to sneak onto my PC is something I would never elect to install either because it’s junk, contains spyware/malicious code, or violates my privacy in some way. For example, this morning my JAVA Client from Sun Microsystems notified me a security update was available. I always pay close attention to security updates especially if they impact my browser. Since the JAVA JRE provides JAVA services for IE and Firefox, I approved the prompt to go download and install the latest copy of the SUN JAVA Client. And that’s when Sun started peddling software. Some versions of Yahoo! 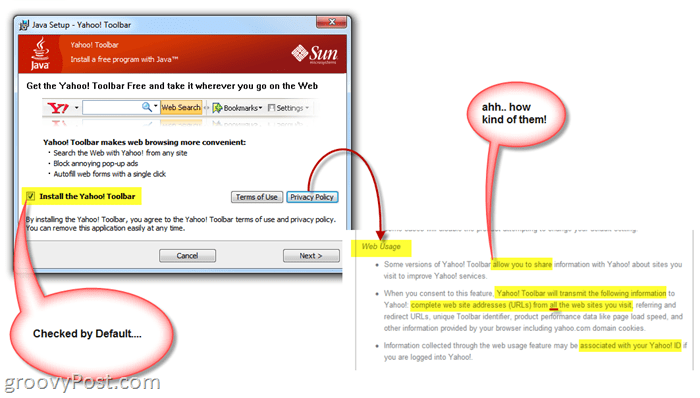 Toolbar allow you to share information with Yahoo! about sites you visit to improve Yahoo! services. When you consent to this feature, Yahoo! Toolbar will transmit the following information to Yahoo! : complete web site addresses (URLs) from all the web sites you visit, referring and redirect URLs, unique Toolbar identifier, product performance data like page load speed, and other information provided by your browser including yahoo.com domain cookies. Information collected through the web usage feature may be associated with your Yahoo! ID if you are logged into Yahoo!. All yahoo.com domain cookies are transmitted automatically to us by your browser when Web Usage is enabled. Yahoo! 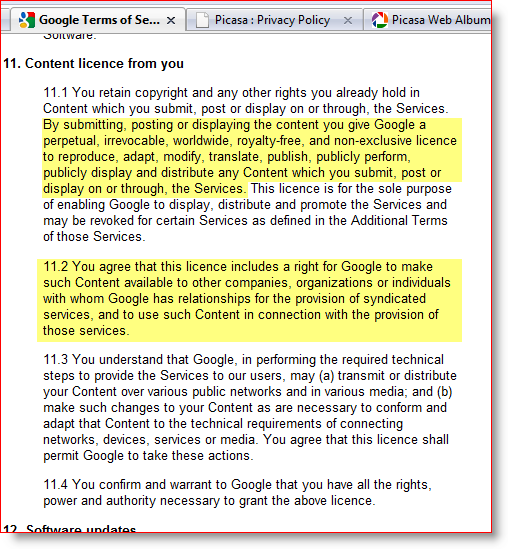 selectively records only certain yahoo.com cookies with Yahoo! Toolbar usage data and does not store cookies that contain or are associated with Yahoo! account IDs. You can disable the Web Usage feature at any time. Directions are found in the Yahoo! Toolbar Help area and from the Options menu in Yahoo! Toolbar. Some might ask “MrGroove, why are you getting so excited about this? You can just uncheck the box and not install Toolbar.” That’s true however I wouldn’t consider myself to be the average PC user either. I’m looking for stuff like this each time I install a piece of software, but that’s usually not the case for the average computer user out there. So, the next time you install a piece of software, or an update, be sure to pay attention and don’t just click Next, Next, Next. Also, Read the fine print even from so-called industry leaders. Otherwise, you never know what might set up camp on your hard drive. Not to say this isn’t sham but, I’m going to guess ALL the toolbars out there do the same thing. Still, they should not have it install by default. That’s lame. Hello there, I would simply like to state that I have very much loved analyzing this info. It makes a change to discover something that is as well though out and instructive as this. I will definitely be returning right here to glance at any updates. Thanks again for this fulfilling read. Related Items:privacy, rant, Security, Yahoo!